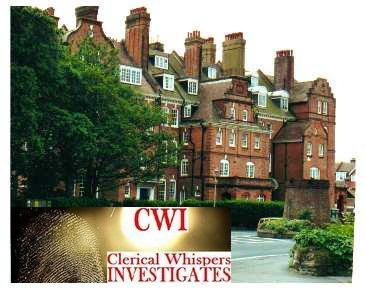 I am the subject of a CW Investigates story: Catholic Prelate Property Scandal. I regret that this unverified story has appeared on your blog. Needless to say the substance of the allegations are untrue and I am presently receiving legal advice to protect my reputation. Facts: Over the past three years my bishop, Bishop Kieran Conry (Arundel & Brighton) and other diocesan officials have received complaints about me from a Mr Simon Duffin. As a director of Helena Court Resident's Association (non commercial) my fellow directors and I am are duty bound to ensure that the 15 leaseholders pay their maintenance and other service charges. Mr Duffin declined citing dispute with the Managing Agent. The Board of Management took him to a Lease Valuation Tribunal (LVT) and won with costs. Prior to the LVT hearing and afterwards Mr Duffin has brought pressure on me by writing letters of complaint to my bishop, Cardinal Cormac O'Connor, the Apostolic Nuncio and more recently to the Congregation of Clergy in Rome. Now he is going to the Internet. The directors mentioned and others are also seeking legal advice to stop this irrational harassment. In good faith may I ask you to please remove the story from your website. SV-ED: Msgr Madders, we print both sides to all contributions and await response from those whom you have mentioned in the contribution above. We thank you for taking the time to contribute in realtion to your side of the matter. Congratulations to Mr. Duffin. I am a fan and applaud him. Very interesting that the member of the Church calls a member of the laity (Mr. Duffin) seeking help and intervention from his immediate Church superiors and the higher ranks in the Church IRRATIONAL HARASSMENT. Over the past 4 years I have had reason to do the exact same writing to Archbishop Diarmuid Martin, Papal Nuncio in Ireland, various departments and Cardinals in charge of Priests at the Vatican to no avail as your requests for help are brushed under the carpet. However similar to this member of the church I have been accused of IRRATIONAL HARRASSMENT been accused by Church's bought and paid for psychiatrist that I am 'not normal' just because I sought out my rights as a human being and a member of the Church and took legal action against the Priest in question. What are we expected to do - lie on the ground and let the Clergy walk over us and wipe their feet on us or fight back when they are in the wrong and have done us an injustice. I congratulate all the others who take a stand like I have done and fight back for our rights. The members of the Church don't have any special priviledges in law. The Internet is a tool to highlight injustices and Thank God for that.